The scientific confirmation of a highly virulent strain of H5NI avian influenza in a commercial poultry farm in Jaji, in northern Nigeria, has the makings of a potential nightmare. As noted by the World Organization for Animal Health (O.I.E.) and the World Health Organization (W.H.O. ), this is the first reported case of the virulent strain of H5NI avian influenza in Africa. However, although this is the first confirmed finding, the O.I.E. 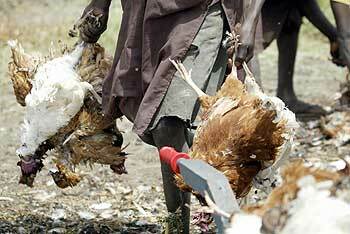 reports that for nearly a month, chickens have being dying in the thousands at the farm in Jaji, Nigeria. Now, bird flu is confirmed in two other states, Kano and Plateau, according to Nigeria's National Veterinary Research Institute. In these two states, thousands of chicken have died in the last month. For all practical purposes, the avian flu may have spread faster than expected, possibly to other states in the country, neighboring countries and other nations along the so-called Black Sea-Mediterranean flyway. Consequently, if the spread of the avian flu in Nigeria is due to migratory birds, then it is likely that other African countries along the migratory pathway should anticipate outbreaks. Since more than 80 percent of African families keep domestic chickens and other birds at home for income-generating and nutritional purposes, it is very clear that a human-to-human form of virulent avian flu could occur, and in devastating proportions. Africa may now be in the throes of a major outbreak. For a continent battling H.I.V./AIDS and other infectious diseases, an unchecked outbreak of human strains of avian flu will be catastrophic. I wrote an earlier article on how Africa can cope with an avian flu outbreak. This article sounded an alarm on the lack of preparation against avian flu in many African countries, the lack of a solid, coordinated continental response, and the lack of technical and logistical capacities to deal with massive outbreaks in animal and human populations. In addition, the debilitating role of widespread poverty in Africa remains an obstacle to the effective roll out of sound veterinary and public health responses. The article provided an overview of avian flu prevention and outbreak management strategies. The situation in Nigeria, a country whose government has far more resources at its disposal than most other African countries, is already showing the major challenges ahead. An outbreak in other states in Nigeria remains a distinct possibility. The government's decision to pay poultry farmers the equivalent of less than $2 for each culled at risk chicken is already a tough sell since farmers may not consider the payment adequate. Local news reports in Nigeria indicate a rush to sell chickens at rock bottom prices. The quarantine and culling of chickens will be a logistic nightmare as most families raise chickens in their backyards. Ideally, cullers should wear protective gear that is not readily available. A mass vaccination program against poultry will also be a very difficult undertaking. The dangers of a human infection are now real if families are unable to cull chickens and other livestock deemed at risk by local authorities. The veterinary and public health systems in many states of Nigeria are not in a position to manage large outbreaks of avian flu. Comprehensive information, education and communication (I.E.C.) campaigns will require considerable technical, financial and logistics resources. A good sign in the last few days is the aggressive general information campaign of the Nigerian government. The aggressive campaign may be responsible for the reported shunning of low priced chickens. However, a comprehensive I.E.C. campaign goes beyond general government announcements and proclamations. It requires specific targeting of the knowledge, attitude and perception of at-risk populations, and working toward changing personal behaviors. Africa faces a tremendous challenge if avian flu takes root. Immunocompromised and sickly individuals are at gravest risk if human infection breaks out. The situation calls for mobilization of technical, financial and logistic resources to meet the needs of those at risk. National governments, regional institutions in Africa, the O.I.E., the W.H.O. and the international community should quickly come together to prevent an avian flu epidemic on the continent. This collaboration should implement well-known and documented effective measures such as comprehensive information, education and communication campaigns, rapid response and effective surveillance, detection and diagnosis systems for animal and human outbreaks, and strengthening of public health systems at local, national and regional levels. Today, Africa is simply not in a position to cope with avian flu without timely, coordinated and significant technical, financial and logistics assistance. Luckily, at this moment, there is no confirmed human case of H5NI influenza in Africa. Every effort should be made to minimize the possibilities of human infection.